A man who stabbed a convicted child killer to death has been jailed for a minimum of 24 years for his murder. 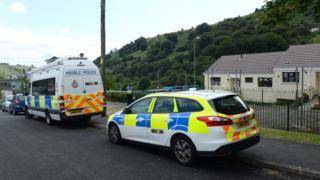 David Gaut received 176 knife wounds in the attack by Ieuan Harley, 23, in New Tredegar, Caerphilly, last August. Harley was sentenced at Newport Crown Court on Monday while two others were also jailed for their part in the killing. Gaut served 33 years for murdering a 17-month-old boy and was freed in 2017. A trial last month heard Gaut had been invited to a neighbour's flat, after the past conviction was uncovered. Gaut had pretended he had been in prison for murdering a soldier. But his neighbours discovered the truth about his criminal past after searching his name on the internet. The court was told that David Osborne, 51, an alcoholic with a "low IQ", and Darran Evesham, 47, helped Harley move the body and dispose of evidence. Harley, of no fixed address, was found guilty of murder and perverting the course of justice. Evesham, from New Tredegar, was found guilty of perverting the course of justice, while Osborne, of Elliots Town, was cleared of murder after he had admitted perverting the course of justice. Evesham was jailed three and a half years while Osborne was given two years and four months. In a victim impact statement read out on behalf of Gaut's mother, Phyllis Gaut said: "To some people he was a monster, but to me he was my son and I loved him." In 1985, Gaut, then 21, was sentenced to 32 years after being found guilty of torturing and killing 17-month-old Chi Ming Shek by fracturing his skull. The child, known as Marky, also had a broken arm, lacerated liver and torn spleen after being beaten and burned. Harley's actions were described as "savage" and "brutal", as the court heard he had a number of violent convictions to his name. The judge, Mr Justice Lewis, said Gaut had experienced "real suffering" at Harley's hands before he was "brutally" murdered and mutilated after his death. "You wanted to make him suffer, and you did before finally killing him," he said. Det Supt Judith Roberts, from Gwent Police, said: "The shocking level of violence inflicted upon David Gaut - both before and after he died - is reflected in the prison sentence handed down to Ieuan Harley today." She also said she wanted to "pay my respects to David's family, who in the past eight months have had to come to terms with his death and re-live events of the past, in which they played no part".